Background: The combined orthodontic regenerative therapy approach can greatly enhance periodontal conditions and dentofacial aesthetics in many situations. The purpose of this study was to evaluate the effectiveness of 940nm low-level diode laser biostimulation in enhancement of intrabony wound healing with combined orthodontic/regenerative therapy in chronic periodontitis subjects suffering from malocclusion. 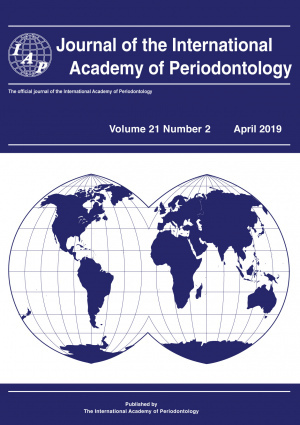 Methods: Fifteen chronic periodontitis adult patients with at least two intrabony defects and requiring orthodontic treatment for abnormalities in occlusion were included. A total of 30 defects were divided into two groups and treated in a split mouth design. The defects were treated with combined orthodontic regenerative therapy with laser irradiation (Group I: test group) or with combined orthodontic regenerative therapy alone (Group II: control group). The following hard and soft tissue measurements were recorded at baseline (prior to surgery) and after six and nine months postoperatively: probing depth (PD), clinical attachment level (CAL) by periodontal calibrated probe and bone density (BD) using the DBS-Win software. Results: Probing depth reduction was 64.57%±9.37 and 64.95%±10.07 with no statistically signifi cant difference between Group I and Group II. Percent change in clinical attachment level gain were 59.77%±12.107and 38.83%±7.56 in Group I and II respectively,with a statistically significant difference (P-value =0.005 considered significant). Moreover, defects treated with combined orthodontic regenerative therapy with laser irradiation showed significant preservation of bone density with a percent decrease of 4.14%±3.17 at the end of the study period. Conclusion: Improvements in clinical and radiographic parameters were observed following the adjunctive use of low-level diode laser therapy and orthodontic regenerative therapy for the management of intrabony defects in chronic periodontitis patients.